TRIVIA of Noh : Q117 : What is Shinji-mai, a ritual dance with strong links to Noh? | Home | Trivia | Q117 : What is Shinji-mai, a ritual dance with strong links to Noh? What is Shinji-mai, a ritual dance with strong links to Noh? Sada Shrine is one of the three major shrines in Izumo Province (currently Shimane Prefecture). It was named as the second-ranking shrine of Izumo in Engishiki, the book of laws and regulations in the Heian Period (794-1185). Sada-shinnō, one of the Shinji-mai, a holy dance passed down at the shrine, has deep connections with Noh. Sada-shinnō is part of the annual shrine ritual, Gozakae-sai, held on the 24th and the 25th of September. There are three elements: a festival called Shichi-za; a holy play known as Shiki-sanban; and a mythological play, Shin-nō. Shiki-sanban is a form of ancient performing art closely related to the Noh play "Okina". Shin-nō is believed to have been created in the Keichō era (late 16th and early 17th centuries) by Miyagawa Hyōbu Shōsuke Hideyuki, the shrine’s chief priest and head of its shintō musicians, after he learned the postures and styles of Sarugaku, which was then popular in Kyoto. There are many common points between Shin-nō and Noh. Both feature actor roles such as shite, waki, tsure, and tomo; pauses in dialogue are filled by songs; music is played on flutes, small and large tabors, and drums; and actors wear masks. On the other hand, there are several differences. The fact that Shin-nō musicians wear white clothes suggestive of priests tells us that Shin-nō was passed down as a shrine ritual by priests and parishioners. 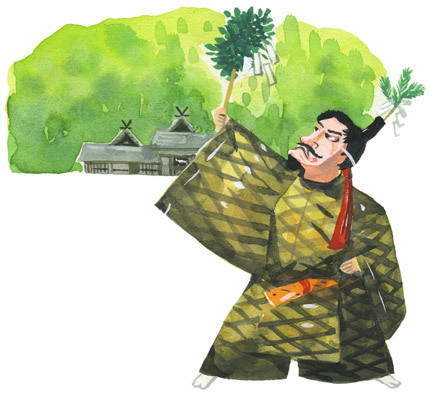 In November 2011, Sada-shinnō was added to UNESCO’s list of Intangible Cultural Heritage of Humanity, recognizing its history over 400 years and origins as Izumo Kagura.